Our mission is to develop and maintain a program that will provide affordable, flexible home access on a timely basis for those in need. "Cost estimator for warehouse materials"
Our primary activity is to build wheelchair ramps for people with disabilities that have inadequate financial resources. Volunteers provide free labor. For those that are able, we ask that they purchase materials. For those that are qualified, we will assist them in applying for grants to fund the material purchases. Materials for many ramps cost between $500 and $1000. We will also assist and advise others with accessibility needs that have adequate financial resources in solving their accessibility problems. Our assistance is focused on the Cedar Rapids metropolitan area, Linn County Iowa and surrounding counties. Click here for client testimonials. 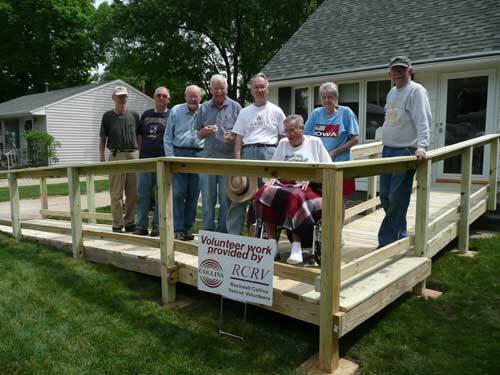 We also accept donations of used ramps in good condition built from treated lumber or aluminum ramps. Used materials are used to reduce the material cost for people with financial need. Financial contributions would also be most welcome and useful. We are a coalition of volunteers, community service organizations, and many other community service minded organizations. Click here for a current list of coalition partners. WRAP recognized that there is a need for economical and easily-constructed handicap ramps. The ramps need to be quickly built by non-profesional builders without sacrificing structural integrity. We created a PDF document, Handicap Ramp Design and Construction Guidelines, to standardize and streamline our ramp construction. WRAP has created a brochure describing our vision and services provided. It is available as a PDF document or by contacting the WRAP Intake Coordinator. WRAP has also prepared a short presentation explaining the program in more detail. Organizations in the Linn County area may schedule a presentation by calling the WRAP Intake Coordinator.